My first DIY eurorack module. It had no instructions! But that wasn't a problem for this little kit. great. thanks for the overview of the build on your site. im sure it will be useful to other people. i dont provide docs for this build as its pretty straight forward. yea the normalling on the jacks is an error that im going to fix. it carried over from the 6 channel vnicursal vca design i have. this is a newer module, so im glad you found the problems and figured it out on your own. It's a nice little VCA. Signal looks very clean on the scope, too. What will the illuminated toggle button do? The toggle buttons are just normalled to 5v to open or close the vca. That version should be out by knobcon or so. 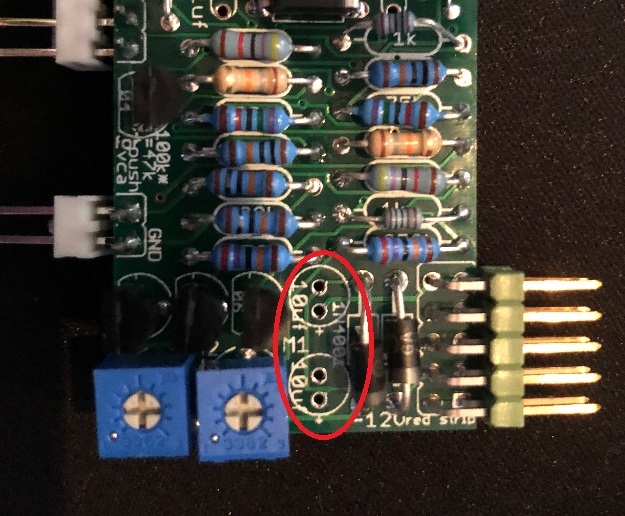 I just got the PCB+panel, and I'm slightly confused, because all the capacitors that are labeled 0.01uF in build doc and BOM are now 0.1uF on PCB. What's the right value? I got the kit recently and the supplied caps were also 0.1uf, which leads me to believe the build doc is slightly out of date. If these are decoupling caps then it won't matter if they're 10nF or 100nF. To check if they're decoupling the ICs just check and see if they're connected from the +/-V pins to ground. just use a continuity tester. For the LM13700 pin 11 is V+ and 6 is V-. The cap should be right next to the pins if laid out correctly and should be connected to ground. For the 072 pin 8 is V+ and 4 is V-. In the meanwhile, Keven answered me: "They are supposed to be 0.1uf. I will update the docs." Edit: Wrong module thread, was looking for help with VnIcursal VCA. I just finished building two of these, but on one I cannot get sound out of channel 1. 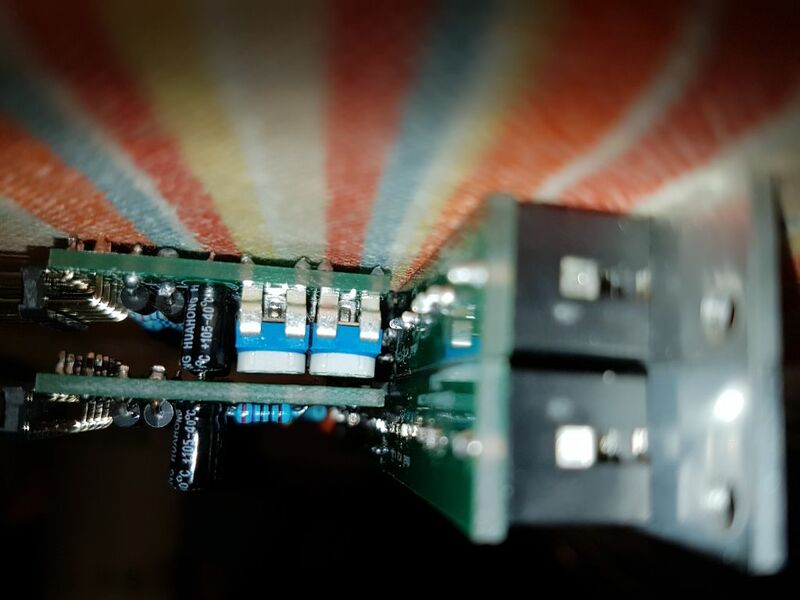 I switched boards and confirmed it is a single mother (bottom) board where the problem lies, I just can’t see anything different between the two. I verified all resistors and caps are the proper values and no components are touching. I did a rotation of ICs just to see if that may have an effect on operation but no changes. Looking through s magnifier I can’t see any (obvious) bad solder joints. I was hoping to get hold of a schematic or a better diagram to know what components are part of the channel 1 circuit so I can try to pinpoint the problem. Anyone know if anything has been made available? It’s really hard trying to follow traces in such tight spaces, even more so with everything already in place. I wish I had a suggestion. IMHO all DIY boards should be supplied with a schematic diagram, for troubleshooting. I drew one for this VCA, but did not publish it, since Zlob doesn't. I would contact Zlob and ask for a schematic. As an aside, I am selling mine, because after I had built the Zlob, 2hp came out with their dual VCA, which I like better. I just ordered a pcb panel set since I've already got all the other parts. Hope this VCA works out well. I've got all these annoying 2hp gaps in my cases and this is much better than a blank panel. I don't quite understand where these two 10uf caps are in the BOM? Don't worry about the BOM. BOMs usually have errors. Just install the capacitors, respecting the polarity. I just looked at my build page. You seem to have a newer version of the PC board. Mine does not have locations for those bypass caps. That is probably why your BOM does not have them. My decision was to add 0.1uf caps, in place of the reverse power protection diodes, because I knew that more bypassing was needed. Looks like they fixed that. Yes, mine says "rev iv", and the build doc refers to rev III . So two caps then. Electro I guess? Those might work. Mouser # 647-USR1E100MDD are smaller in size and would certainly fit. I wonder if rev IV got the change to the mix output that I proposed. I modfied mine to always mix both outputs to the mix out. As it was, patching into one of the two channel outs would remove that channel from the mix. That made more sense for a VCA with four or more channels, but not for this one. I guess I'll just trim the pins with a file, and add a touch of hot glue on top of capacitors. But for the next two sets that also arrived today, I'll make sure to find smaller caps. i also bend the trims back/down a little so they arent sticking straight up. i do offer schematics/eagle files for troubleshooting if you ask. yea mr pugix, you got one of the earliest versions, the normalization was fixed soon after. im thinking of combining two of these into a single panel, and ive been thinking about adding attenuators on the cv inputs. cant find the schematics online so hard to say before my pcbs at arrive but im assuming there is an input resistor on the cv input? could i simply wire a pot in series with this resistor? would i need to then swap that resistor out with something smaller? You could make your own panel. It would need space for the CV attenuator pots. In that case you don't even need the front PC board. Instead, you would solder wires from the main PC board over to pots, jacks, and LEDs mounted on your panel. That could work fine, but you would also need to figure a way to mount the PC board behind the panel, since the jacks wouldn't be doing that now. You don't put an attenuator pot in series with the CV input. You make a voltage divider, with the top going to the input jack, the bottom to ground, and the center going to the CV input. It would be the same as patching an external passive pot to the CV input. A nice modification would be to normalize +5V to the switch lug on the CV input jack. That way, just like the 2hp Dual VCA, your CV pot can act as a level control when no CV is patched in. Thanks so much!! Appreciate all the detail its exactly what I needed! I actually have some synthrotek blanks on their way and was planning on using a 6 or maybe 8hp. Also I ordered some tiny aluminium L-brackets, 20mm x 20mm and a bunch of m3 bolts and screws, my plan is to mount the PCBs perpendicular to the panel as if I had used right angled pots, one board on each side and just wiring the pots and jacks up. Just looked at a photo of the PCB and it doesnt look like theres any space to drill a hole for the bracket, maybe if I soldered a small piece of protoboard to some straight headers and then soldered that to the unused header holes on the PCB then it would offer enough support? Guess Im just gonna have to experiment! As I am slowly becoming fan of Zlob , I can suggest their MiniAtt - you get two pots (passive module) and a cool looking 2hp panel for $15. If you already have all the tools for making it yourself (cutting aluminium, drilling it, anodizing it, screen printing on it), you can probably make your own panel and PCB for less than $15. But if you don't have all that, you'll be much better with MiniAtt. I have one of these to try, but Im looking at all those small yellow caps and Im thinking I shouldnt be putting ceramics in there.. What are they? I tried googling the package type, but not got anywhere.. Are the multilayer monolithics?